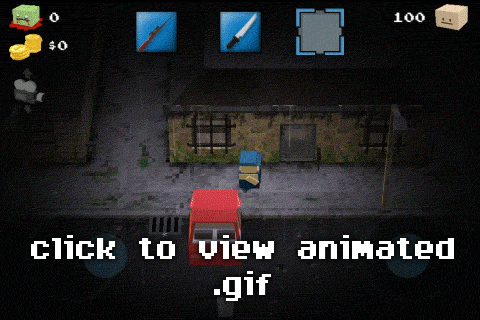 I'm making an open-world, destructible-environment, zombie-apocalypse sandbox game for iOS called Zombox. 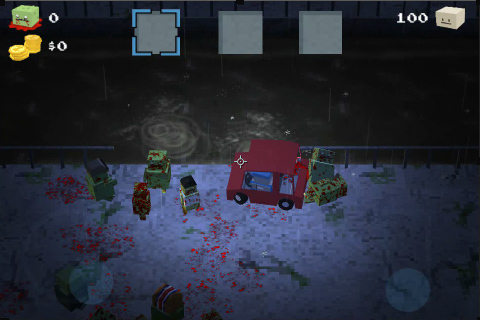 With the iOS gamer audience penchant for zombies you could be onto a winner here. hey, I've seen you on the reddit screen shot saturdays! Loving what I've seen so far. Yea I post there every week...but have been meaning to branch out a bit, found this forum and figured it would be a great place to post as well! 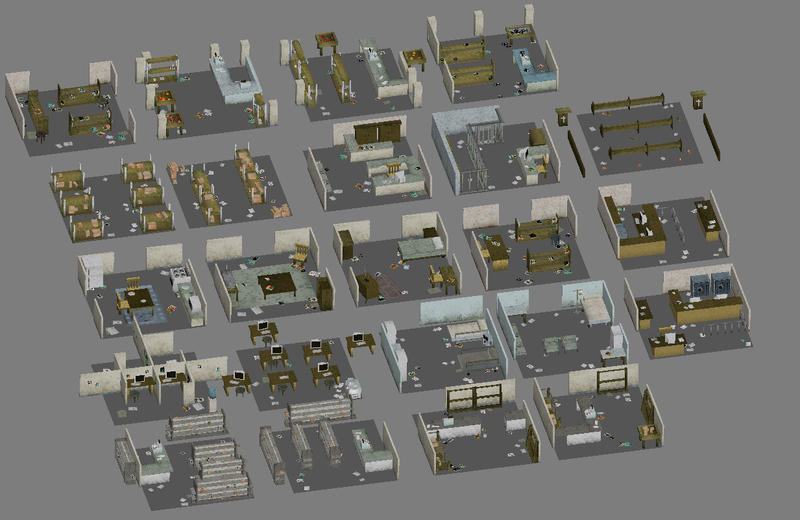 Here's a bit of a behind-the-scenes look at Zombox's object pooling system, which manages to maintain a huge sprawling environment, full of hundreds of destructible objects, on iOS devices with no in-game load times. 1) is it possible to destroy off screen objects. I notice you have preemptive loading of the next area based on where you are facing, but what if I shoot a rocket? (can I?) Can I damage buildings not loaded? 2) is it possible to move fast enough that something won't be loaded in time? 1) Nope, although there are no projectiles in the game that can shoot far enough to hit off-screen objects. I'm going for a more legitimate survival experience. So there aren't going to be rocket launchers, although if you raid a police station you'll come across regular guns, maybe some explosives that you can throw (but can't throw far enough to hit anything off-screen), etc. If I ever *do* decide to add things like rocket launchers, I can just make it so if they go past the boundary of the currently visible tiles, they explode midair. 2) The car is about the fastest thing you can move in, and there's no noticeable pop-in when driving it at full speeds around the world. At the most, you might have 1-2 frames where a couple of objects on the edge of the screen haven't loaded yet, and I can adjust the loading coroutine to get rid of this entirely...it's just that right now I've got it tweaked so that it runs optimally on iOS devices (so it loads necessary objects over a few frames rather than all at once...moving colliders and rigidbodies around gives Unity's physics system a bit of a hit). Keep in mind that 80% of the screen is occupied by the center of the 9 tiles that are loaded each time you move around...and the objects on it are loaded first. So while the other 8 tiles load after, you can't really see them do it. 3) There's no load time as you move around. All data for the entire world is procedurally generated when the game is started and stored in memory (all navdata, city data, etc...takes about 40 mb of RAM). That initial load time is about 1.5 seconds on PC, and about 5-10 seconds on mobile devices. Then, as you move throughout the environment, those data arrays are queried and they tell the pooling system which chunks should move where. On my PC the game runs at about 750 fps. On my iPhone 3GS it runs at about 20-30fps, and on my iPhone 4G it runs at around 30+.....the majority of the processing time goes towards physics and rendering. The pooling system's processing time is pretty negligible (minus the physics processing time that is incurred when moving the colliders around). I can't wait to see more (or even better, play it). I love the menu art! Thanks for the technical details. The animated gif alone is worth a thousand words. Character customizations have been added to Zombox. 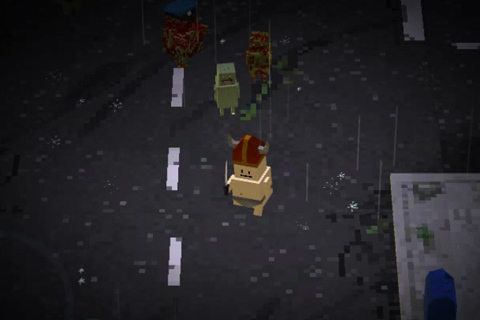 The main character can now be dressed in various clothes, including over 60 hats, shirts and pants. Each clothing item provides a unique bonus to the character's stats. Some items provide extra armor, some provide extra hit points, some increase speed, some increase the chances to land a critical hit, some increase attack and others regenerate health. 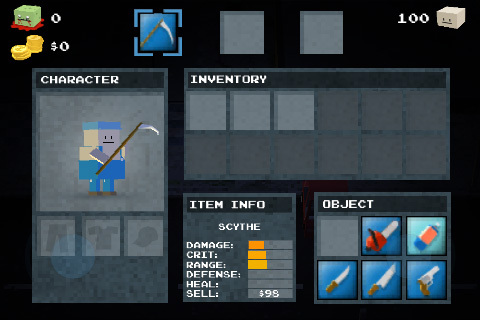 The clothing items, like all items in the game, can be found throughout the world. Click here to watch a video of the clothing system in action! More updates have been made to Zombox! Did some more work on Zombox this week. 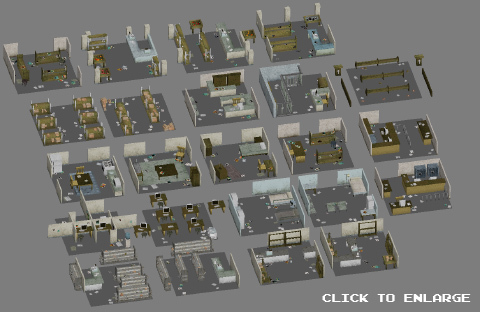 -Worked further on modeling building interiors. -Got an object interaction system prototype working. When the player touches an object he/she can interact with, it begins to glow and a context-sensitive icon appears in the top right of the screen which can be pressed. This is some amazing stuff. 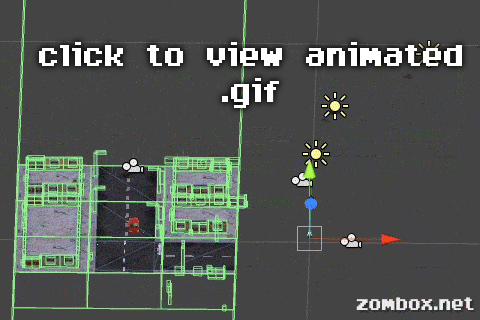 People need to add more animated gifs like this to showcase their games. Well done! Oh dear. Safari is not liking all of these gifs on one page.